I remember waking up in my father's home to the smell of fresh steamed rice. There was never any cereal or pancakes that I can recall. Instead, there was fresh fish in the refrigerator and washed vegetables on the counter. "What would you like for breakfast?" dad would ask. 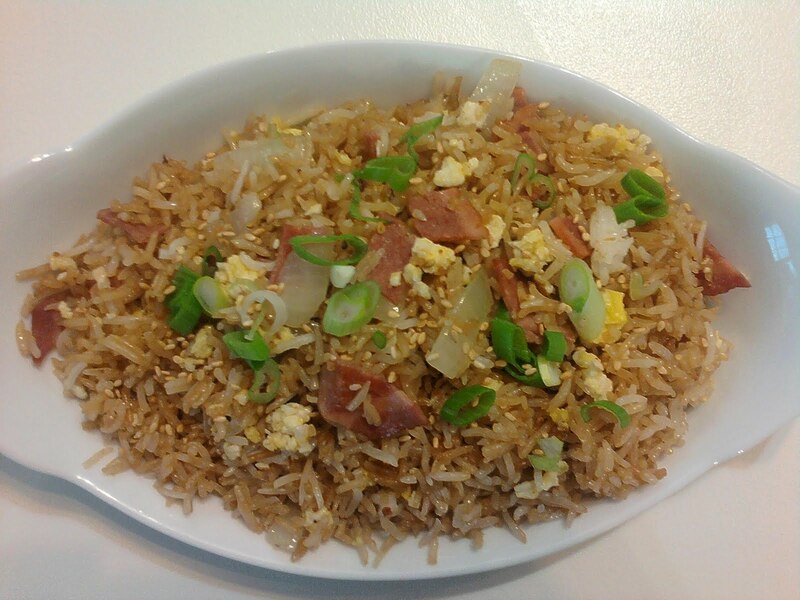 The answer was always the same; 'fried rice'. I have fond memories of his quick arms working to the rhythm of the sizzling oil, tossing in eggs, bacon and then the rice. It is still one of my favorite breakfast meals. The recipe has transformed over the years, but I think dad would be impressed. Note: It is important to have all ingredients prepared beforehand, as stir-frying is a very quick process. 1) place a large non-stick wok or frying pan on medium high (if using turkey bacon, drizzle in a little oil). 2) Add chopped bacon and onion and cook until onion is transparent, and bacon slightly browned. Remove onion bacon mixture onto a papertowel lined plate and set aside. 3) drizzle more oil into your pan if using turkey bacon and add eggs. Scramble eggs in pan creating bite-sized pieces, then remove to a small separate bowl and set aside. 4) There should be a light layer of fat/oil left coating pan. Now add your cooked Jasmine rice. 5) fry the rice using a spatula, making sure it doesn't stick to the bottom of pan. Add soy sauce to taste. 6) toss in your bacon/onion mixture and stir. 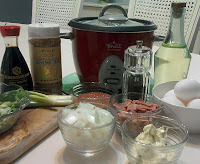 7) toss in your scrambled eggs, stirring gently. Salt and pepper to taste. 8) scoop in 2-4 tablespoons of garlic butter mixture and stir gently. 9) garnish with green onion and sesame seeds. Cool. Store in container and refrigerate leftover. Simple Garlic Butter: mix softened butter and 1/2 teaspoon garlic powder together with dried cilantro/parsley. Note: Grapeseed oil is excellent for stir-frying as it handles high temperatures. Just a note on rice. I probably would not find life worth living without it. It is a staple in our home. We eat it 4-6 times a week in many forms. If any of my children claimed to not like it, I would say they were mixed up at birth. My first dinner date with my husband was at a Thai restaurant of my choice. He tasted chicken panang for the first time and was completely enthralled. I noticed he wasn't eating his freshly steamed white rice (which in my mind was a misconduct and a definite incompatibility trait). He claimed it was too plain, but when I explained that he was meant to eat the panang and sauce over the rice, I opened a whole new door in his life. He now orders more steamed rice then me. 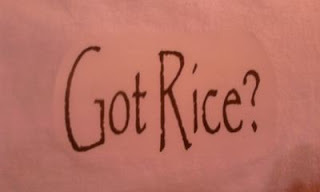 I've been told by my aunt Zenaida, that in the Philippines during WWII, my grandmother was saved by rice. Pregnant with one of her 9 children, she crawled on her hands and knees through the rice fields, concealing herself for hours while carefully evading the adversary. So to me, "Rice is Life" literally. The above "Got Rice?" pic is a t-shirt I made for our 5 year old. 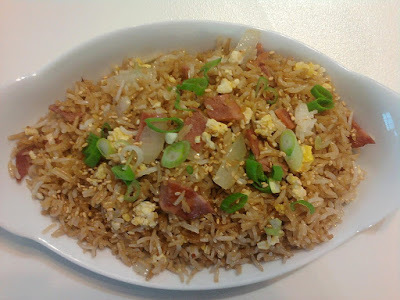 What is bread and butter to some, is hot rice and chopsticks to another. 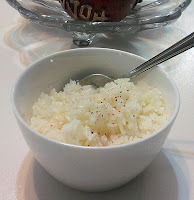 Some mornings, a bowl of rice and butter with a mild sprinkling of salt is a perfect way to start the day. (You don't have to use chopsticks).